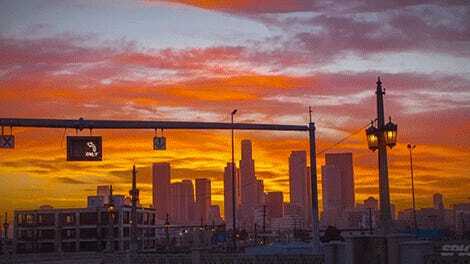 Keven McAlester’s short film which compares Los Angeles’ Bunker Hill in the 1940s to today using perfectly synced footage is the closest thing we can get to experiencing legitimate time travel. In 1959, shortly after the black-and-white footage on the left was filmed, Bunker Hill was the focus of an ambitious urban-renewal project, which is why so many of the homes and low-rise structures visible in the 1940s are all gone in the present day video of the city’s downtown core. Was it for the best? LA isn’t known as the country’s prettiest city as a result, but to this day it still remains the dominant urban center on the west coast.